To Hear the Angels Sing– We created this combination remedy to support listening to the God within as well as the Angelic kingdom who are best heard when we are grounded in our hearts in a place of oneness. Daffodil– This beloved Flower Essence has an I AM affirmation that says it all: I AM attuned to the voice of the God within. Allamanda– If there was a lot of yelling, criticism and angry words spoken during your childhood and as a consequence you tend to believe harsh critical feedback over loving kind feedback, Allamanda helps to dissolve this erroneous filter so you can be more objective about criticism directed at you and see it for what it is-the ideas of other personalities, not absolute truth. This paves the way for you to hear and take more seriously the loving words of the God within. Allamanda from Taiwan– If you have internalized negative verbal patterns of abuse and are constantly saying mean things to yourself, this Allamanda helps you let go of this pattern. It helps you stop kowtowing to the fear that all this critical inner dialog is true and therefore is something you need to keep telling yourself. French Marigold– French Marigold takes on the job of healing any sort of hearing glitch that interferes with us hearing what is actually being said. 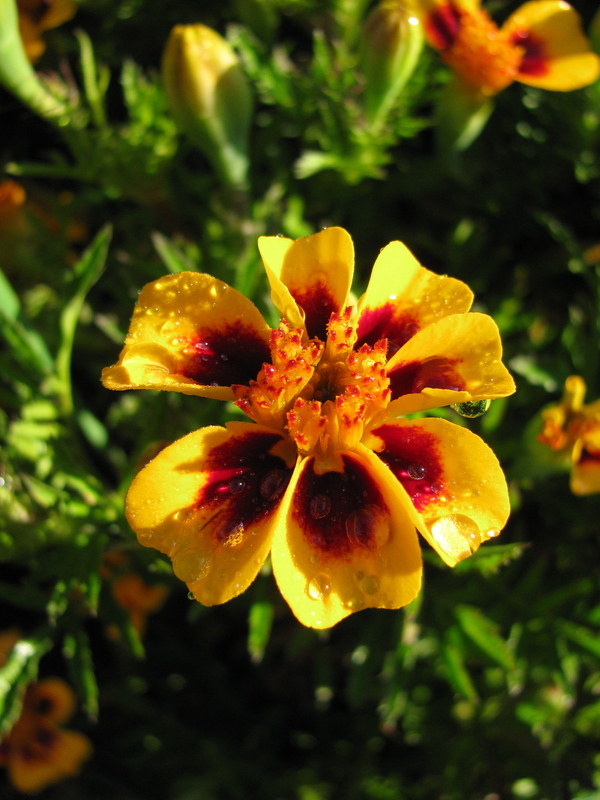 It helps us handle radical change, energetically rebuff inharmonious mutations and in an era in which we are being bombarded by new untested technologies, French Marigold helps us protect our hearing. Spider Lily– This one helps us sort audible data so that we screen out lower vibration information and hear more clearly high vibration wisdom including the voice of the heart. 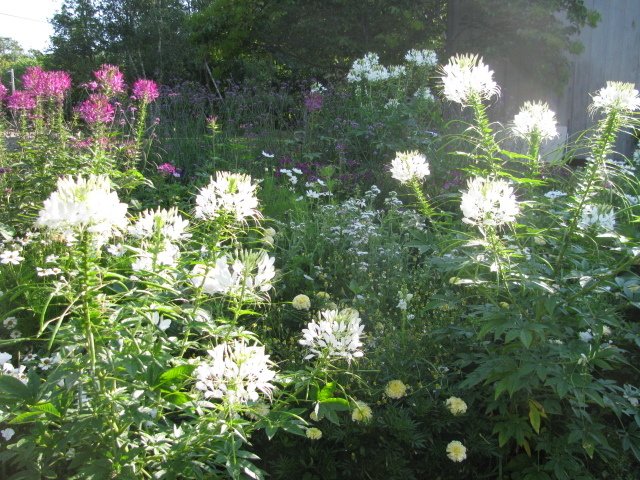 Fireweed– This Flower Essence helps us breakthrough any blockages we have about accessing spiritual wisdom. Fireweed grows particularly well on recently burned land. This reflects how it can support us after our lives have been burnt to the ground and help us find our way and access the inner truths we need to move forward to a new life. The last one I am going to mention is such a wise friend. When I asked the Angels what they wanted me to write a blog about this morning, they promptly said, Listening. So I settled in to listen to what they had to say about Listening. “You are connected to all that is in every conceivable way, but it is through listening that you can appreciate the connection most deeply. By this we mean not so much attention to sounds made or voices raised or external noise but the kind of listening that happens deep within you. This kind of listening requires considerable determination. Yes, you can hear the voice of God within in the most noisy and crowded circumstances, but that takes a lot of practice. It is much easier to carve out quiet and solitude then build a trail to your heart in this peace and stillness. Why does this stillness matter? You exist in a most complicated structure of infinite possibility, yet few paths lead where you truly want to go. By seeking stillness you eliminate a lot of choices that would clutter your life. When you disentangle from the world’s broadcast, you peels back layers obscuring truth. People often find there is grace in circumstances that takes them into a time of enforced stillness. For Molly, the time of breaking her arms forced her into a time of stillness. In a recent blog she mentioned that during her recovery from these injuries she felt whole even when literally broken. This was because more time in stillness had swept her into deep communion with her soul. Constraints of illness or injury often bear fruit, because an external focus is no longer possible. The only road open at such a time is the road within and the practice of listening to what is going on “in there”. Not only is stillness important but time for stillness matters too. Some things cannot be rushed. Inner listening takes you deep into knowing what truly matters to your soul. As you return to this sacred well of inner Divinity time and time again, the messages get refined and repeated. That “off the wall” guidance you got the first couple of times you listened, keeps coming back to you again and again. This can build your confidence in intuitions that seem unexpected or peculiar. So much of who you truly are and what you are meant to do is against the grain of the cultures you exist in so, yes, we stand by the word peculiar and remind you that peculiar is not wrong. Peculiar is just distinct from the prevailing behaviors of your culture. Messages repeated in the quiet space of attentive listening bolsters your own determination to follow this inner guidance. Let yourself blossom in the stillness. Let yourself blossom in the listening. Give yourself time to unfurl and drink deeply of your eternal and timeless self. Don’t feel that you need to share your inner knowing until you have given it time to settled within you in stillness. How often have you shared a precious realization with someone not ripe for this wisdom only to feel defeated by skepticism or disinterest? Let yourself drink fully from your inner listening. Let yourself rest in all you know in this quiet still pool of inner oneness. No matter how confused and murky my own mind can get, like a bell ringing its pure note, the messages I receive day after day from the Beloveds here to support us all are so uplifting and encouraging. There seem an infinite number of ways that Divinity can help us to keep going, and apparently I have needed a lot of them to navigate this last month! Thank you again dear ones for your tireless love and many messages encouraging me to Lose Mind Not Heart. Don’t Worry-Bee Happy and Loving What Is are two particularly helpful Essences in this effort to dismiss monkey mind and trust one’s heart and the unfolding path we are all on. If you want to read the original description of Loving What Is from the Guidebook, I have put it below. I really love what a thorough job the Angels do in their description of this Essence to dismantle all our minds ideas about its own importance. Sending you much love and encouragement to keep on keeping on! Here’s the description! Our culture puts the mind ahead of the heart. This is because our culture is a construct of minds. As a creation of minds, our culture believes in the mind’s authority and encourages us to keep our minds in charge of running our lives. The culture encourages us to listen to whatever mind ideas are screaming loudest on any given day and judge our experiences as good, bad or ugly in relationship to these mind ideas. No countenance is given to how mind ideas leave us suffering, because the mind really only cares about staying in control. To keep us in check, the culture constantly changes its collective mind standards. If we are always running after the new mind ideas of the culture, we have less time to consider that maybe the mind, either our own or the collective mind of the culture, should not be in charge of driving our lives. The collective mind of the culture and our individual minds have no interest in our happiness. What they want more than anything is to stay in charge. It is grace that mind standards can never be met for more than short tension filled periods of time. This is because life is not a servant of the mind. In those times when our lives do not conform to the collective mind or our individual mind’s ideas of what life should be, the door opens for us to abandon the hold the mind has on us. This doorway is a blessing, not so much because it alters the abyss between mind ideas and reality, but because it encourages us to shift the place where our consciousness is seated from the always dissatisfied mind to the peaceful heart. This Essence is to support us to shift our consciousness to the heart, the only place we can experience peace no matter what is happening in our lives. We must make the decision to change our habit of living in our minds, a place of judgment and restless discontent, in favor of sinking into the heart’s place of unconditional loving acceptance of what life is. “Loving What Is” will help us make the shift and help us to stay in the heart even as every construct of the culture calls us back to the mind’s territory of judgment. What is the problem with the mind? When the mind is given the reins to rule our lives, it rules from a database of contradiction and confusion. This is because the mind is no more than a rag tag bundle of ideas collected from a myriad number of sources including childhood data collected from our family of origin. The ideas we have collected are based on other people’s unique perceptions of reality as well as our own perceptions. These ideas are always going to be in conflict with each other because no two people can see things the same way. From the moment we are born, our minds collect conflicting perceptions. Our fathers’ ideas conflict with our mothers’ worldview and that is just the beginning of the dissenting opinions we collect and call our minds. No mind has any integrity. The mind is a body of information rife with conflicting ideas. My mind would like me to belabor this point with lots of mind ideas. My mind would love it if I did this, because the mind has no capacity to be in charge but wants to be in charge anyways. It will use any idea in its database to keep itself in charge. This means the mind has no hesitation to throw out new conflicting ideas if it feels us waver in our allegiance to it. If we momentarily sink into the happiness of the heart and the mind feels its hold on us lessening, the mind will not hesitate to throw a grocery list of worrying, fearful, guilt laden, contradictory and unhappy thoughts into our consciousness in order to stay in charge. To let our minds drive our lives is self-sabotage of the highest order. No matter what rises up from our tangle of mind ideas as the right opinion of the day, it is always in conflict with other ideas we carry and therefore literally sets up a dynamic of constant inner conflict. The mind, when given the role of running our lives, literally divides us from ourselves. So what is the solution? As Einstein said, “The consciousness that created the problem can’t solve the problem.” The solution to this dynamic lies outside of the minds that created the problem. The solution lies in the heart. It is in the terrain of the heart that we can love what is, sink into a consciousness that is not in conflict with any other consciousness and therefore find the peace and harmony we seek. All hearts are kind and loving because the heart is an integrated part of all creation. Few, if any, minds are kind and loving because the mind, by its very nature, is a hodgepodge of conflicting information warring with itself for dominion. We will never find peace in our efforts to live according to our mind’s myriad ideas of the good life. We will only find peace when we live in our hearts and discover its immense capacity to accept what is. The shift to the heart opens us to love what is. Being in the heart is not a process or a struggle. It is the experience of love. This is because the heart is the eternal and divine part of ourselves that knows its oneness with everything. A life lived in the heart is the experience of what we were seeking all along, an experience of infinite love and peace. The dynamic of this Essence supports us to no longer allow our minds’ to drive the show, to leap into the heart and to stay there long enough for the rewards of this choice to become self evident and we find the motivation to stay there of our own accord. If we have settled into our hearts to some degree, this Essence supports us to abide there as we navigate a world working overtime to call us out from our centered place of joy. When the mind is given the task of implementing the choices of the heart, it becomes an excellent tool for manifesting these choices. This is the only role appropriate for the mind. In January 2007, when planning the season’s gardens, the Angels told me that this Venus Garden would be, among other things, about water. I spent time with the Angels figuring out which plants best represented the dynamic of water and was given a beautiful design that included juicy cucumbers, melons, parsley, nasturtiums, sweet peas and a White Lotus. Seven glazed blue pots filled with Nasturtiums encircled the Lotus; each represented one of the seven seas. 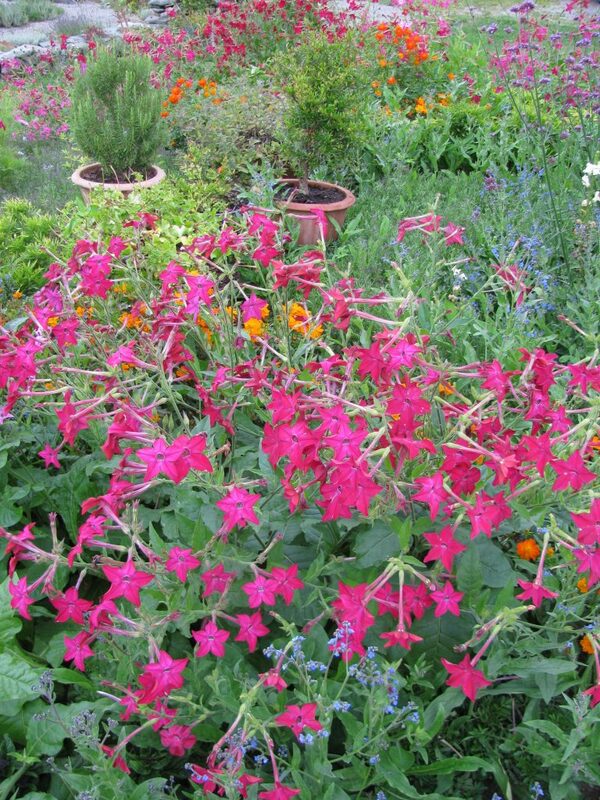 The garden was easy to plant and very elegant in its early weeks. When the Nasturtiums started their display, the garden became a veritable mass of Flowers. The Angels asked me to leave various “volunteer” annuals including a mass of gorgeous deep blue Chinese Forget Me Nots and a big swatch of White Nigella. How well these contrasted with the dizzying oranges, yellows, reds and creams of the Nasturtiums. Oh my mind was so pleased with myself. What a splashy garden! How clever was I! Then the flowering ground to a halt. 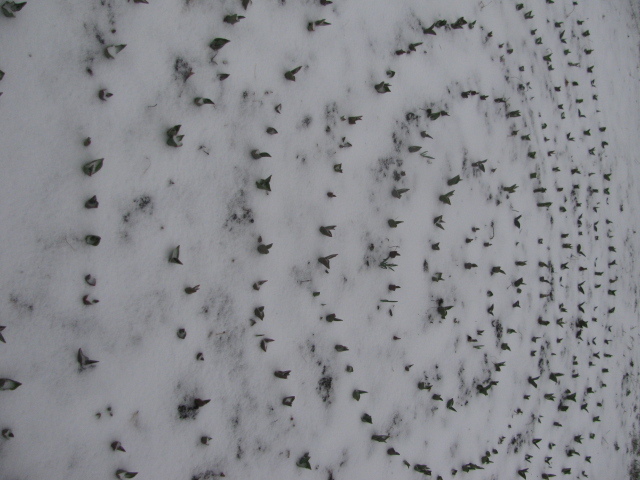 The Sweet Peas that had ringed the garden in abundant and fragrant blossom turned brown and died in the summer heat. The Angels asked me to leave every crisp brown vine in place. How my mind disliked this untidiness! Then the Nasturtiums did what they do when put in good soil. Their leaves got enormous and they stopped blooming. 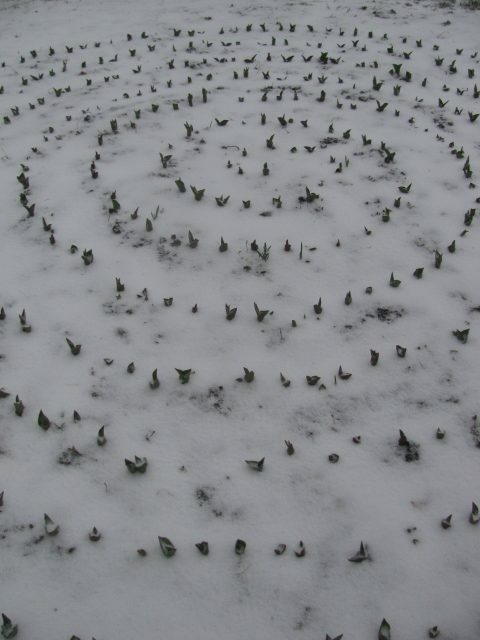 Soon there was not a Nasturtium Flower in sight. The garden looked as unimpressive as any I had ever planted. 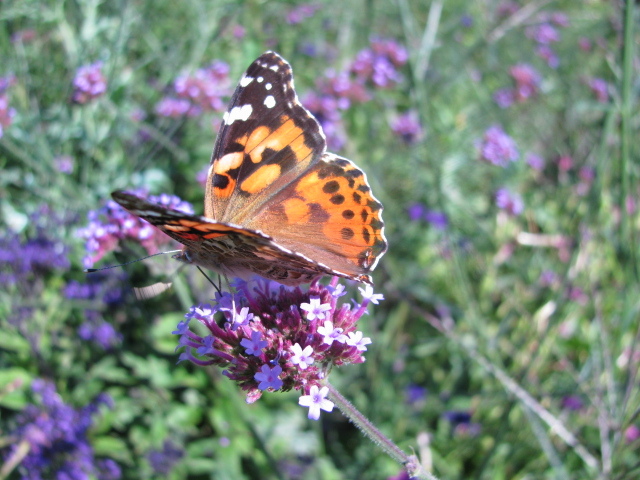 When I was in my heart, I felt the peace of knowing all was well and the garden was serving something in some way. 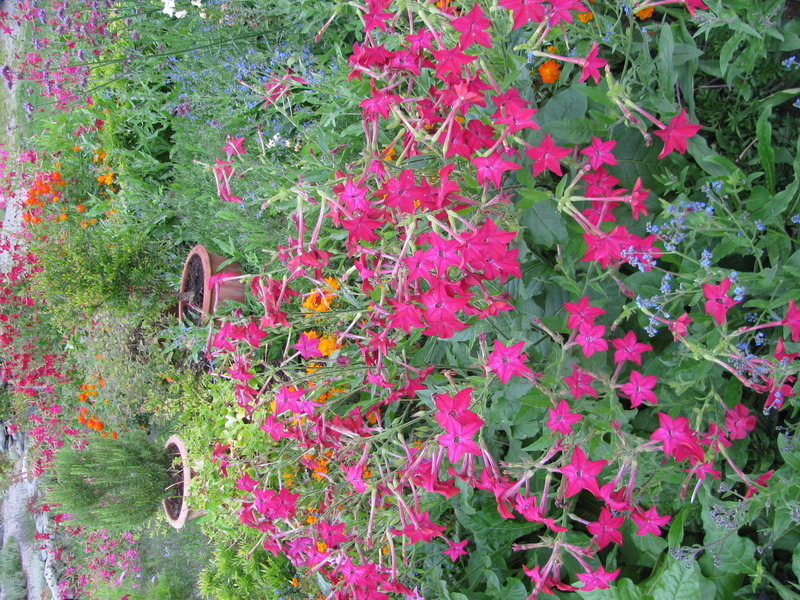 But sometimes, I allowed the appearance of the garden to pull me off balance and back into my critical mind. Then one day, very late in the summer, as I passed the garden with all its weeds, overgrown Nasturtiums and unflowering plants I burst into laughter. Quite abruptly, I fell in love with the garden just the way it was. As I rubbed against this garden in passing, its vibration had helped me fall out of my mind and into my heart. I was so happy to have made such radical peace with the garden. I was completely in love with this big brown weedy mess. In that moment, I experienced the gift of this Essence to move us from mind to heart. I knew there would be a lovely Essence born from this garden and that it would be about loving what is. Why a connection to Water? This afternoon I was regaling the staff with funny stories from the early days here. I described the summer we opened the farm to the public because hundreds of people were showing anyways. It was one of a number of growing seasons when the produce and Flowers were oversized and abundant, and I thought I had licked the issue of insect infestations for all times. We were talking about all this because we’re looking at our labels and considering going “retro” back to designs from the early days. It is hard for this dear young staff to imagine that hundreds and hundreds of people could arrive at the farm because they heard about us without cell phones, instagram or the internet. It’s kind of hard for me to understand too, but I credit the Elementals who have always been timeless and gizmo free networkers. 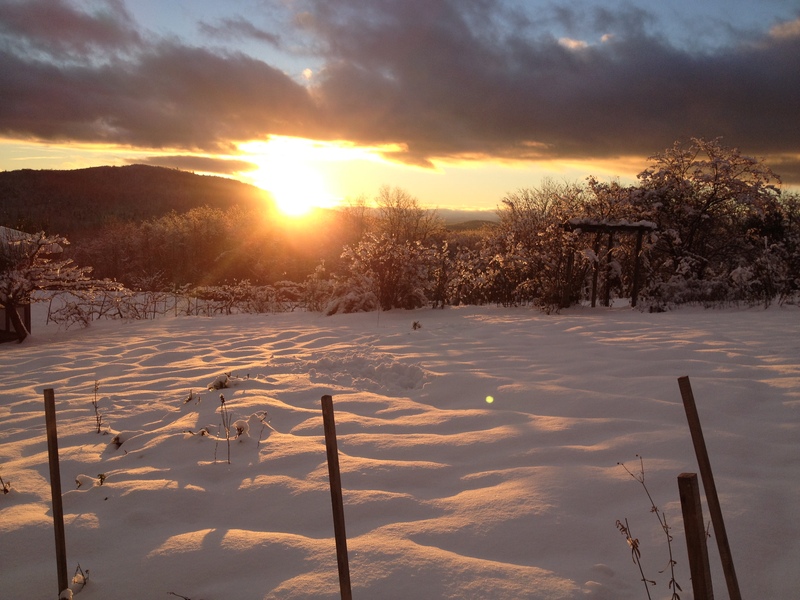 They knew I was sharing life at the farm and the Flower Essences because I was so darn grateful for how joyful and fun and meaningful my life was with them and the Angels as my partners and our joint creations the center of my daily life. 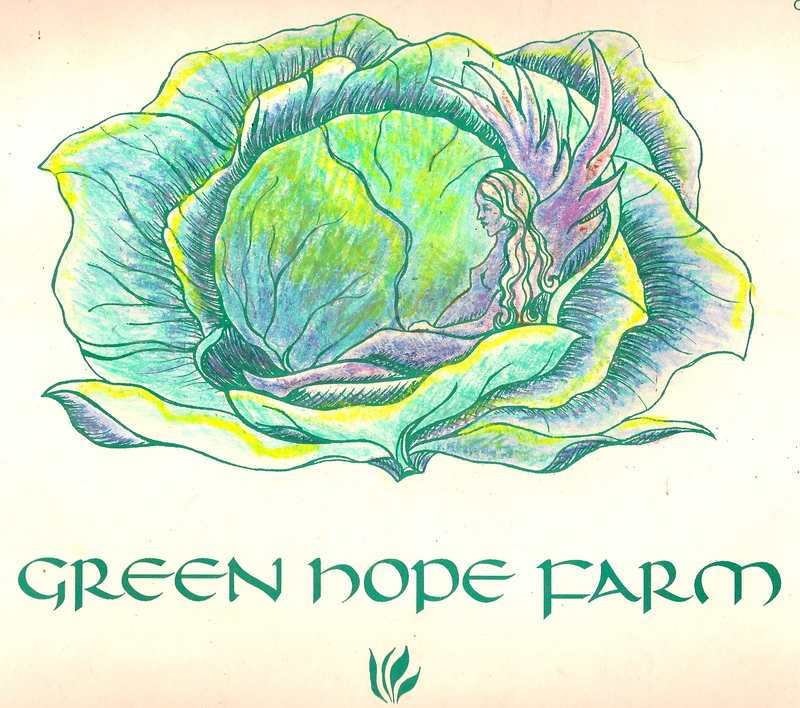 In the years before Green Hope Farm happened, there had been a litany of personal challenges for me, but when we moved here in the late 1980’s, there was a stretch when just about everything I tried to do blossomed and grew. The bumper sticker on my car read, “Life’s a Joy and then you Ascend” and that said it all. If I stuck a stick in the ground, it grew. If I thought, “I wonder what it would be like to do this activity?”, whatever I needed to do that activity fell into my lap. Things went wrong but in funny ways. I’m sure it was more complicated than this, but my memories of this time are wonderful and sweet. My life was in the gardens and the gardens were glorious, filled as they were by Flowers, children, dogs, cats, and fairies. Eventually this time passed and I entered a period in which people and places fell away from my life so fast and so unexpectedly that I could barely process it. The garden lessons grew more complex as well. The harvest was what I learned from navigating the complexities and losses. Life became something I had to learn to savor in the middle of pain and suffering. Like everyone else, I had to grow up. Through the ups and downs, the Angels and Elementals remained ever ready to offer their wise counsel and life up my heart. When I had a positive attitude, it was because I worked to see things this way, not because my world was all sunshine and roses. Suffering can make a person more compassionate, or at least that’s been my experience. I can be in the trenches with you all better, because most of my life I’ve been there with you. Which brings me to this January. WHEW! Did you all survive it intact? What a whirlwind of stripping away whatever “needed to go.” (btw sometimes I’d really like to talk to the big guy about why exactly ALL this needs to go……) Maybe it is just that I am a Capricorn so all this stuff happening in my sign made it more intense, but gosh, some of your emails made me feel like I got off light and frankly, January was a disorienting series of losses for me. 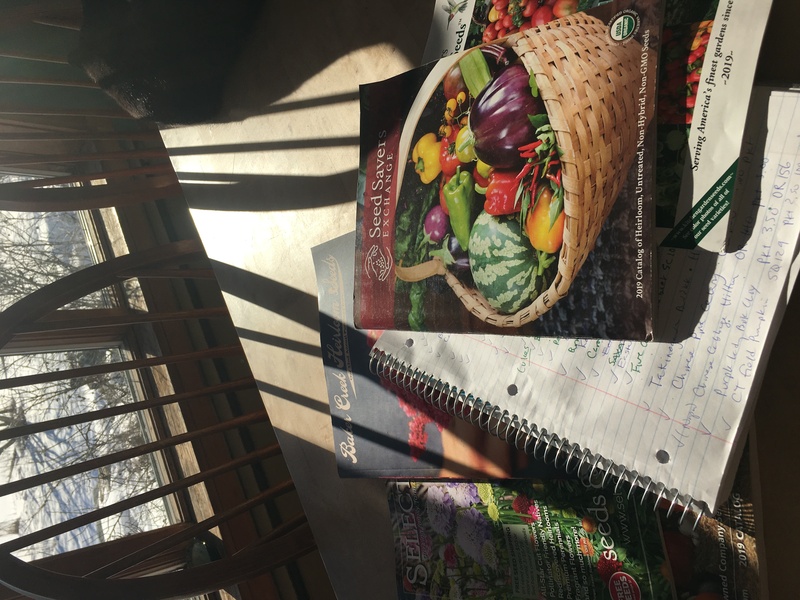 Some things keep going strong- the love of the Flowers or as the staff goddesses call it, “Flower Power”, the presence of Divinity in all things, the seed catalogs that promise the return of Flowers after our long winter, HUMOR and LOVE. Originally I was sitting down to write a blog about creativity, but somehow this morphed into thoughts about how creative times are often preceded by an emptying out or literal firestorms burning things to the ground. In nature, fires lead to new growth in plants. Wild raspberries grow gangbusters on burnt ground and wild blueberries need to be burned through to keep bearing strong. I guess we’re more like berries than we might think. Which leads me to the positive: After this winter time of contraction, loss and challenge, we can look forward to new life and new creative endeavors and their blossoming. Stripped of more self definitions which we thought we needed, we can be open to rediscovering who we are without these labels or these things or people we thought we needed. I remember when I was stopped in my tracks by my broken arms. Both times the breaks were many with plates, pins, and surgeries. As I recovered, I could do very little but sit there, yet I felt whole. I felt like me. Maybe as we experience the new parameters of our stripped down post January firestorms, we will find yet again the wholeness of who we still are and find wonderful creative, funny, joyful ways to express it. 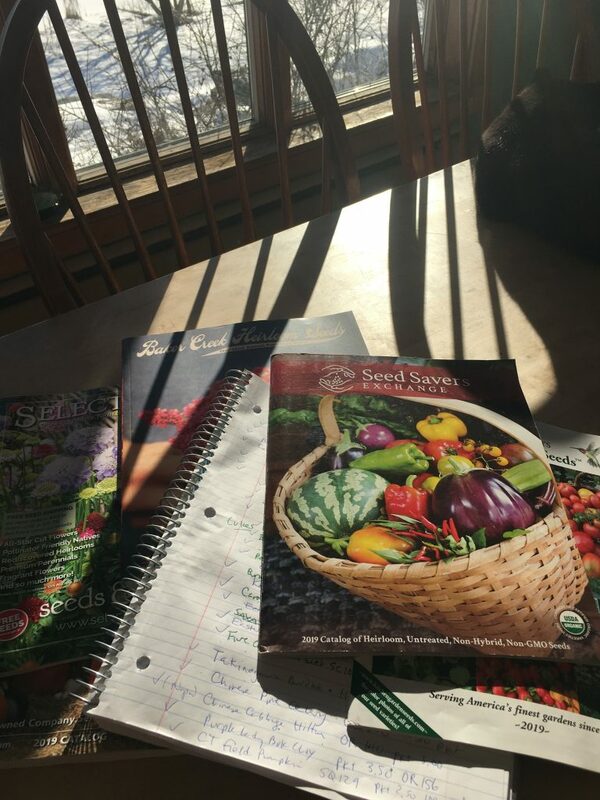 And for me it begins with new garden plans. I’m trying to grow celery for the first time. How about you?